As some of you may have gathered from last week, I had the opportunity to visit Japan as a summer exchange student in 2007. I minored in Japanese in college on a whim, and I fell in love with the language and culture. Because I was studying most of the summer, I didn’t leave Kanazawa too much, although I did travel with some friends for our last two weeks there. I definitely plan to visit again some day (and take my boyfriend with me!). Below is my bucket list of 7 Religious Sites I Want to Visit in Japan. I’ll be the first to admit that I’m not wild about contemporary church design. And while I certainly wouldn’t want St. Mary’s Cathedral to be the norm, I can’t help but be intrigued by it! I find it to be an elegant departure from more traditional churches, although I do miss some of the more typical, ornate furnishings. 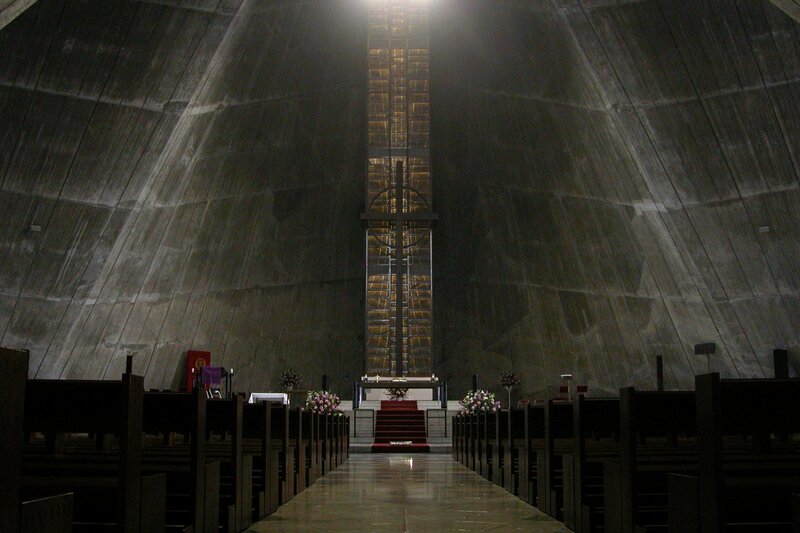 This cathedral was built after World War II, when the original cathedral church (made of wood) was destroyed by fire. It’s design uses eight hyperbolic parabolas and mirrors a similar design of San Francisco’s cathedral. 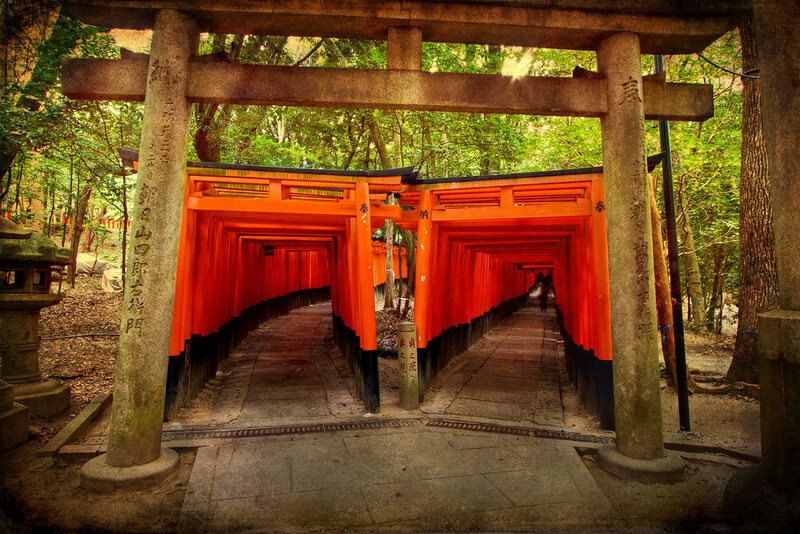 Of all the places I’ve visited in Japan, the Fushimi-inari Shrine is probably my favorite. One of the neat things about Japan in general is how tiny little Shinto shrines are squeezed between newer buildings, and there’s a strange fusion about it that works. 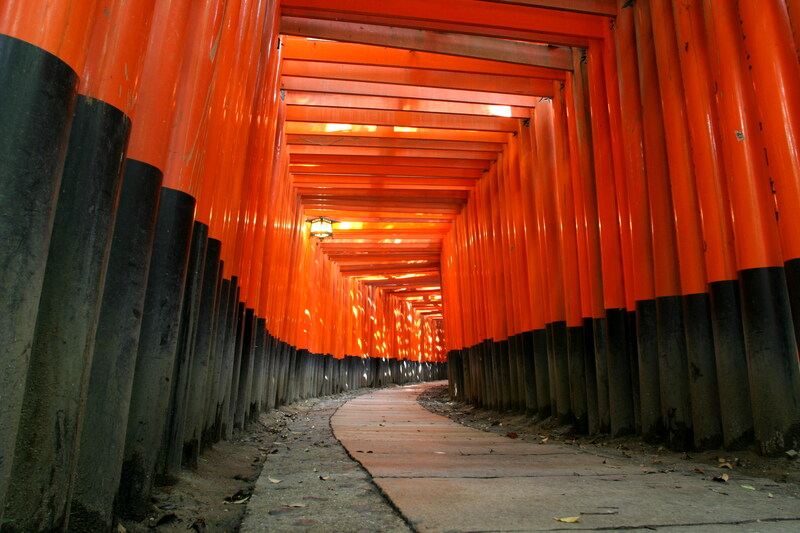 But the Fushimi-inari Shrine is quite large, and is set off by itself outside of the greater Kyoto area. Inari is a goddess who – among other things – is attributed to wealth. Thus, businesses will purchase a torii (gate) in her honor and place it along the path. Their business is inscribed on the torii, and it’s fascinating to read them all. You can start in either torii – they both eventually lead to an inner shrine, and then you can take the other back down. There’s a lot to cover with this shrine, since it’s such a massive complex, so I’ll save that for another post when I inevitably visit again some day. 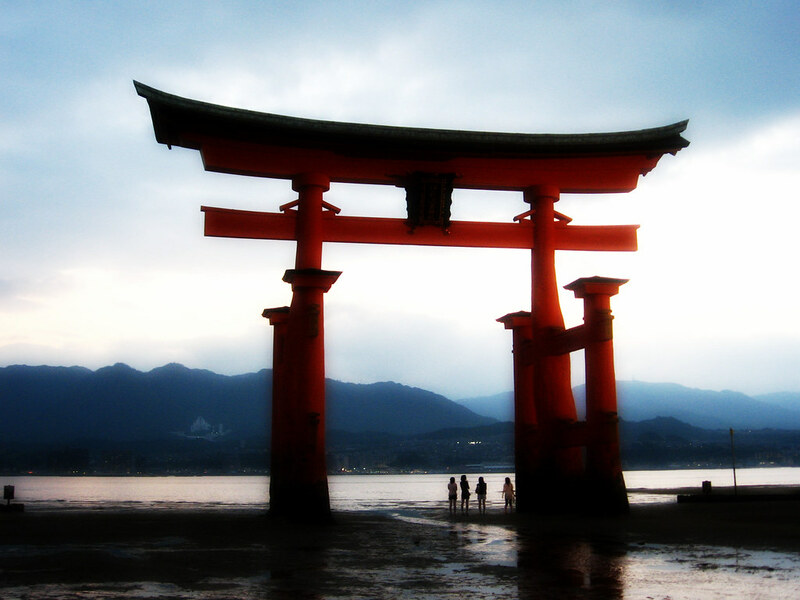 If the Fushimi-inari Shrine isn’t my favorite place in Japan, then the Itsukushima Shrine is. Built just off of the coast of Miyajima (an island near Hiroshima), this shrine is known for the “floating torii”, a massive torii that seems suspended when the tides come in. The picture below is when the tide is out, and has some adults standing next to the torii for comparison. The island of Miyajima has been considered sacred for much of its history, with commoners not being allowed to visit the island until relatively recently. The torii and the accompanying shrine are built on the coast in the form of a pier to allow pilgrims to worship from afar. 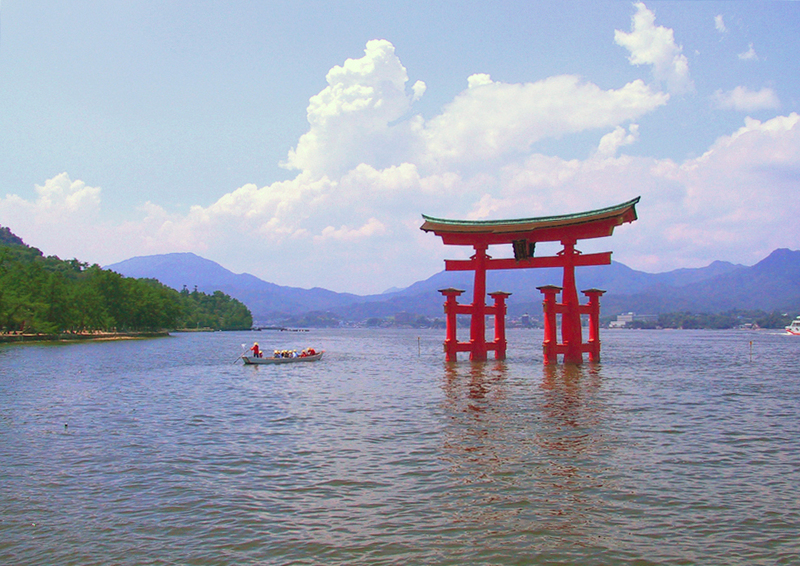 In order to visit in more recent times, boats passed through the torii in order to approach the mainland. 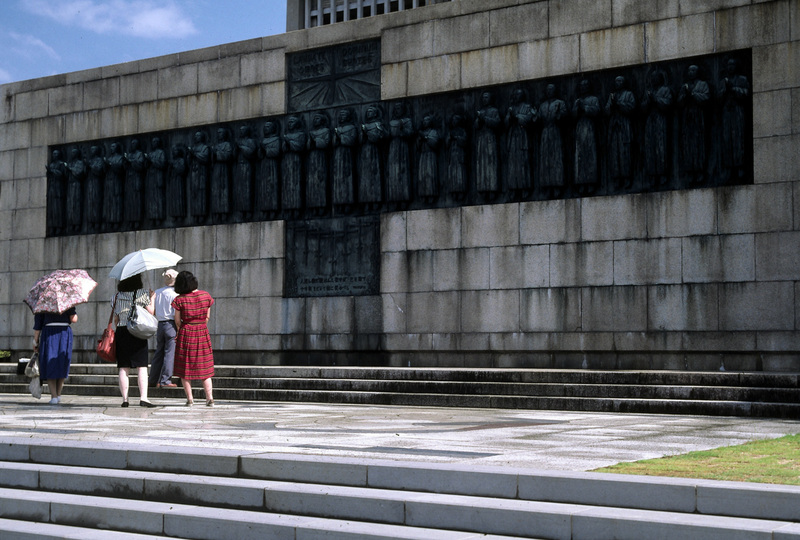 To retain the purity of the shrine, since 1878 no births or deaths have been permitted on the island, with pregnant women, the terminally ill, and the very old being sent to Hiroshima. Burials are not permitted on the island. Did you know that Jesus Christ didn’t die on the cross? It was his brother Isukiri, and Jesus actually fled to northern Japan, became a rice farmer, married and had a family. You’re not buying it? Me either. 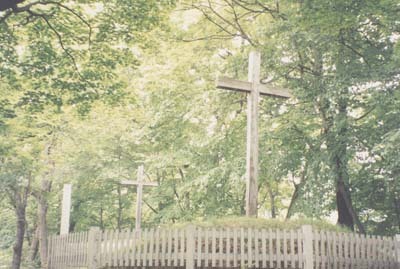 Nevertheless, Shingo claims to be the final resting place of Christ. My interest in visiting here stems mostly from this “Um, seriously?” feeling. The Todai Temple is one of the places on this list I have visited, although I would love to go back. 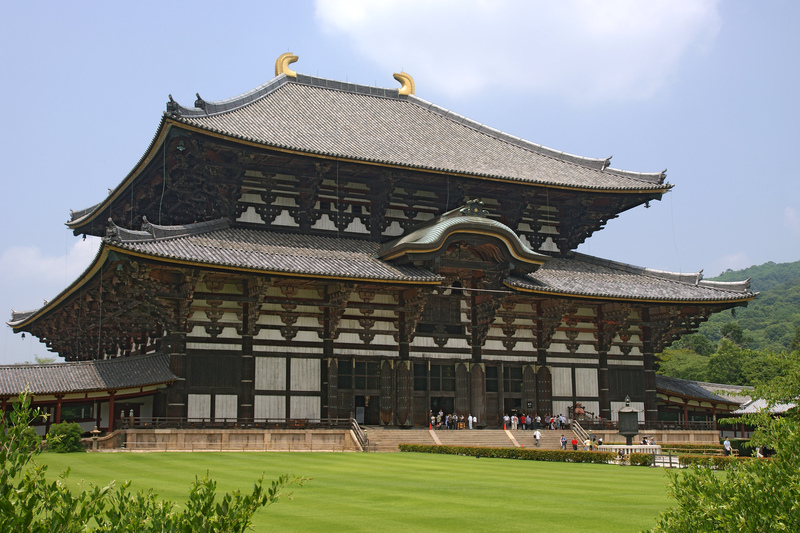 This temple is the largest wooden building in the world; fitting, as it also holds the largest bronze statue of the Buddha Variocana. Descriptions and pictures can’t really do justice to the size of this place. 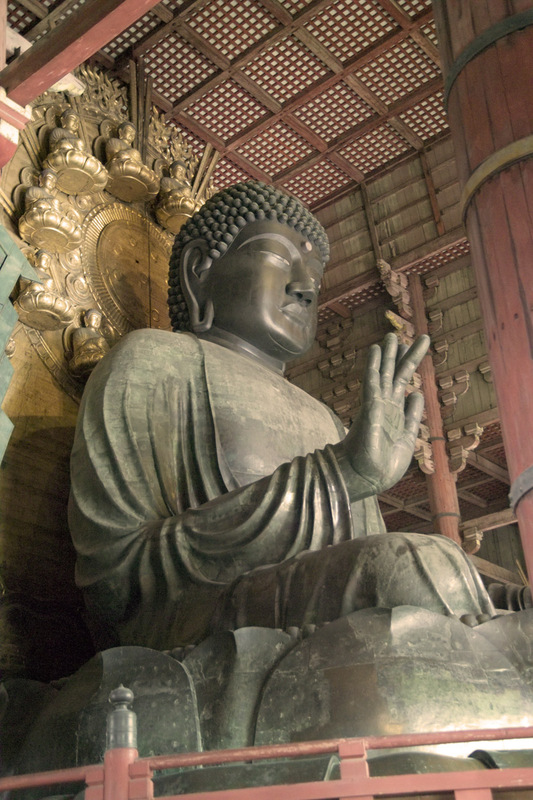 To give some sense of scale, the ears on this Buddha are 8.3 feet long, with the entire statue being 49 feet high! 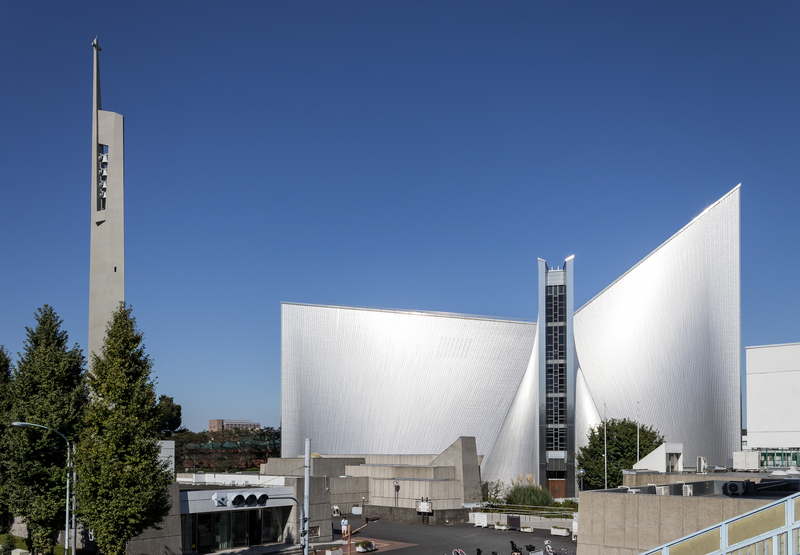 This museum and its accompanying grounds commemorate the 26 Christians (a mix of Japanese and Europeans) who were executed here in 1597. All of those executed were hung up on crosses and lanced to death, with one of the accused (St. Paul Miki) preaching through the entire ordeal. The Church celebrates their martyrdom on February 5th each year. While the museum contains a host of treasures (like original letters of St. Francis Xavier), the most interesting is the display of fumie. “Fumie” literally translates to “stepping on picture”. 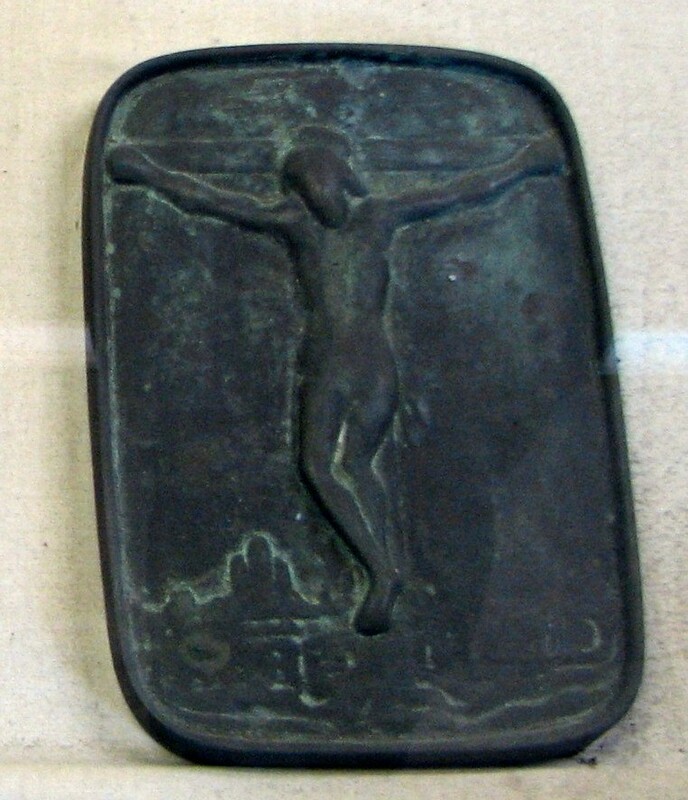 These were small stones with depictions of Jesus or Mary inlaid onto them. Those people suspected of being Christians were asked to step on them to prove their lack of faith, and any who hesitated were imprisoned, tortured, and – if they still refused to reject Christ – killed. You can take a virtual tour of the museum by visiting their website here. 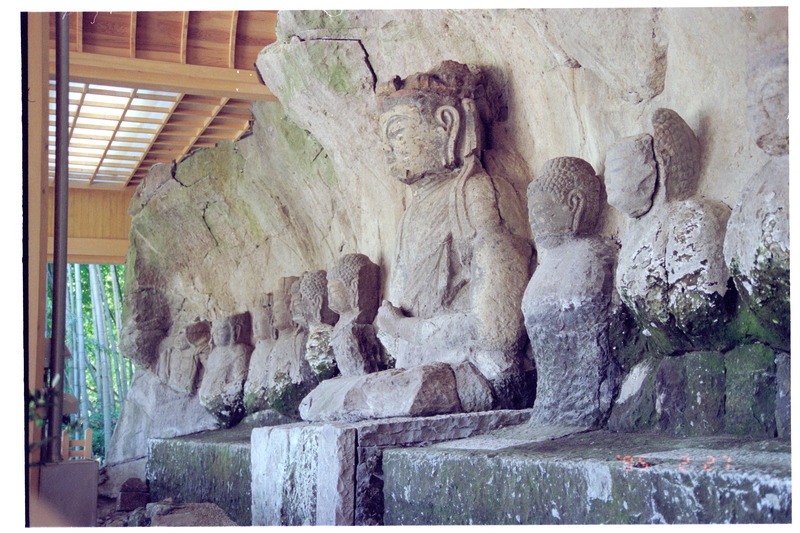 The stone Buddhas in Usuki are estimated to have been carved around the 12th century. There are four groups of Buddhas, but why they exist is still a mystery. Nevertheless, many of them are considered national treasures to Japan. Ever been to Japan and have somewhere I left off? Anywhere you’ve read about and want to visit some day?